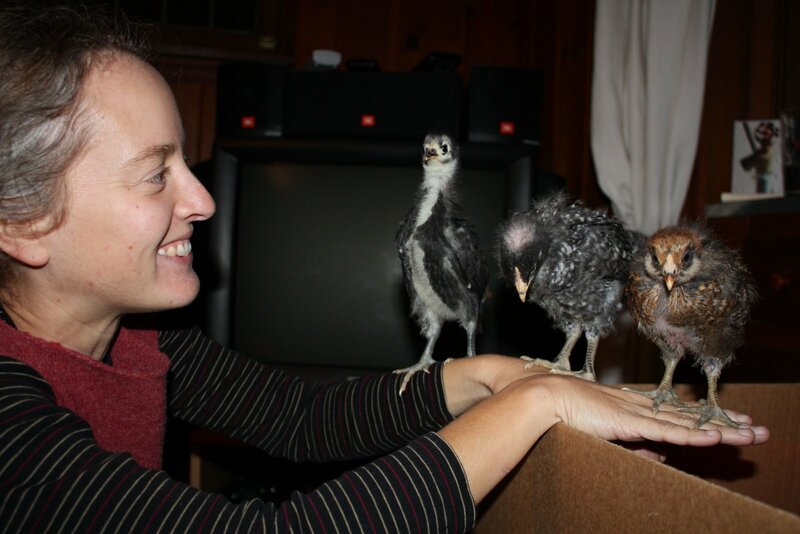 ← Little Baby Chickens, two weeks old, how do you like the world so far? The chickens are 3.5 weeks old, I figure. Their food and water, continually moved up to back height, now sit 4” above the floor. We had to raise the walls of their condo box by taping up the flaps, but even then Rocky has grown tall and strong enough to jump up to the edge. The other night while we watched a movie she jumped up and roosted there, tucking her little head under her wing. They are changing so fast! Beautiful little feathers are growing awkwardly on their shoulders, backs, and chests. Greta has a funny Victorian collar, and two rows of shiny black feathers run down Aussie’s otherwise fuzzy yellow chest. Rocky’s little comb continues to worry us. They seem to like us. They jump up onto our hands when invited. Rocky goes from there to the box edge, or occasionally someone’s head (sorry Liz), but Greta and Aussie are happy to be petted. Greta will sit right down and chirp. Aussie is a little more inquisitive. 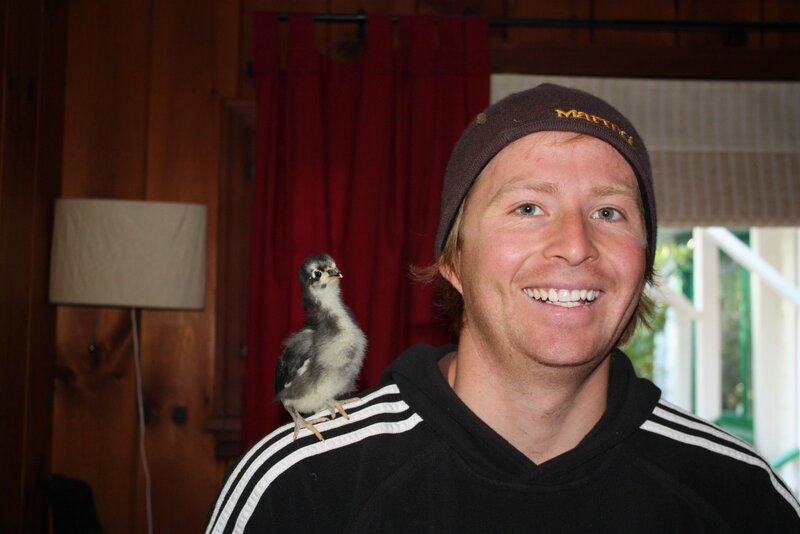 When Walter dropped by last weekend, she walked right up onto his shoulder – so cute! The cat Loca finally became interested in the chicks. Previously, even when we had them out of the box for petting, she couldn’t care less – just lolled on the couch crying for attention as per usual. 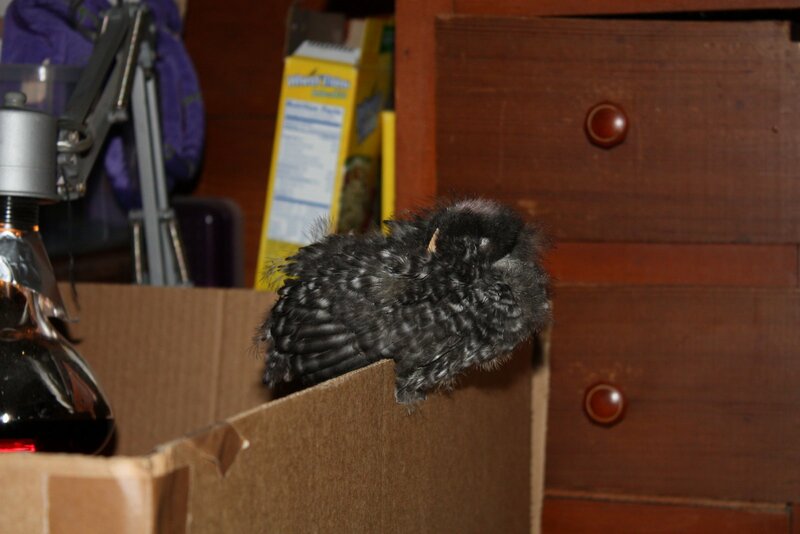 But last weekend Rocky was perching on the edge of the box, and I was sitting on the couch admiring her when Loca walked in the room. Meowed into the room, for those who know her. Loca hopped onto the couch and headed for my lap. Halfway there she noticed the chicken. I mean, the way a predator does – with her whole body. After I put the chicken back in the box Loca made quite a show of sniffing the edge of the box where Rocky had perched. Not good. Eventually the chickens will be big enough for it to be a fair contest, but ‘til then we’ll have to watch out. I continue to struggle with designing an inexpensive, practical, pleasing coop and run for them outdoors. We are having to change their bedding every day and it smells a bit like a chicken coop in there, what with the heat lamp and all. 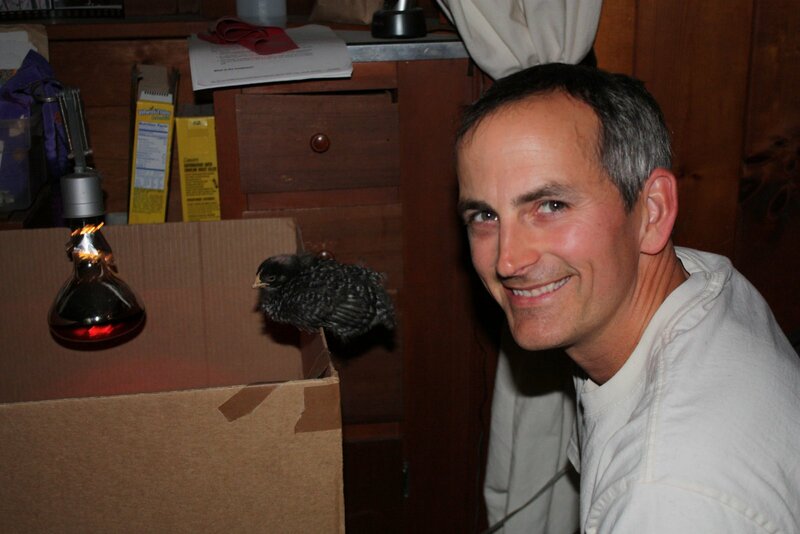 We could move them out to the garage, but I’m hoping to build the coop over the weekend. Meanwhile it rains. And when it doesn’t I’m outside putting down cardboard and dirt to rot our sod and turn our front yard into garden beds. Occasionally I work at analyzing video for my dissertation!